Benito Mussolini was an Italian politician and leader of the Fascist Party, following the March on Rome in October 1922 he became the youngest Prime Minister in Italian history. After destroying all political opposition through his secret police and outlawing labor strikes, Mussolini and his fascist followers consolidated their power through a series of laws that transformed the nation into a one-party dictatorship. Within five years he had established dictatorial authority to create a totalitarian state. Mussolini had the perfect chart for a dictator. The Sun in Leo often believes it has a divine right to lead and Scorpio rising gives a toughness and intensity, but it’s the Moons conjunction with Mars, Saturn and Pluto that really created Il Duce. The Moon with Saturn symbolises the suppressive authoritarian nature of Mussolini’s police force and Mars and Pluto shows the level of violence required to keep everyone in check for 20 years. 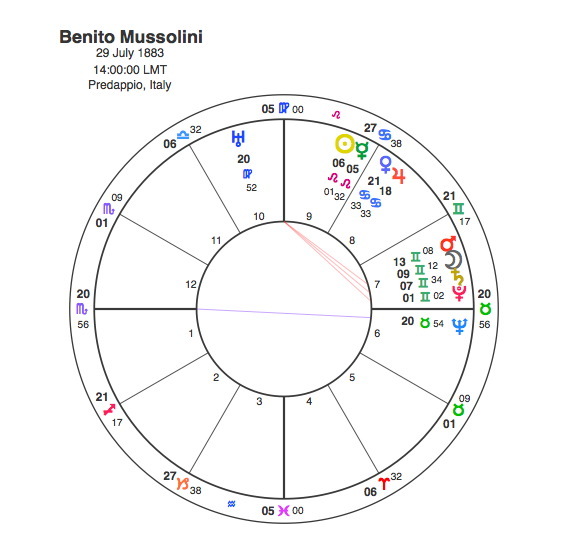 This Ascendant / Moon combination is the kind of thing you might expect in the chart of a notorious serial killer rather than a world leader but the Sun in Leo lifted this chart from brutal thug to fascist statesman and Venus conjunct Jupiter in Cancer showed a genuine love for Italy and the idea that many of his countrymen felt he was looking after their interests. He was also admired by other world leaders before the war intervened. Pluto only made one major aspect in his lifetime, conjunct his Sun in 1943 but one was enough to get rid of him. On 24 July 1943, soon after the start of the Allied invasion of Italy, Mussolini was defeated in the vote at the Grand Council of Fascism, and the King had him arrested the following day. He was executed by Italian partisans In 1945. Benito Mussolini used the natal power of Pluto to hold dictatorial power over the whole of Italy for 20 years, but the planet turned on him in the end.